Alibaba is a great company. A chinese e-commerce giant I have collaborated with many year before it went public in the U.S. The firm have a strong fundamentals, but despite that, Alibaba has declined about 20 percent in the last 8 weeks. This is very interesting because Alibaba grew revenues by nearly 60 percent, and I don`t think it will stop here at all. Nor is it expensive if we measure it with forward earnings which is about 32,4 right now. There must be something going on here. Like we saw in Kohls a few days ago, maybe there is some profit taking here. Kohls has skyrocketed last 12 months. Up about 100 percent. But Alibaba has declined about 20 percent last two months. I think it can be the fear of the coming trade war. There has been a carnage in the Chinese tech sector recently. We saw a collapse in Tencent. A company that lost more than Facebook`s drop. We also saw a big drop in JD.com following poor earnings. 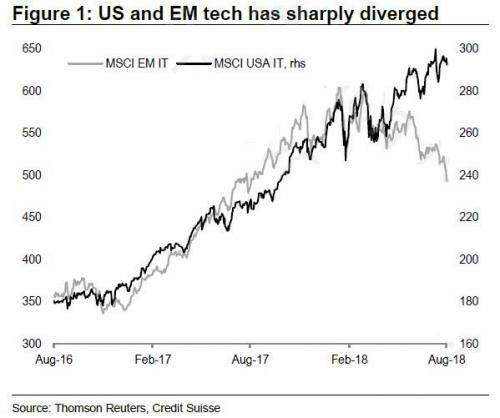 What we are witnessing is a divergence in EM and US tech. Since June, the EM tech sector has accounted for about 40 percent in the value of EM equities. Both, the EM and the US tech sector has jumped about 50 percent to the end of June, but since then, the US tech sector is up by 5 percent, while the EM tech sector is down 6 percent. You can clearly see how Alibaba reached an all-time high in the mid June, trading above $210, and then, alongside other Chinese tech stocks that has declined. The stock is also following the divergence trend. All this is happening despite the fact that the firm is doing it well. The Amazon of China, are also operating three main sites like Taobao, Tmall and Alibaba. In addition, they have a cloud computing firm, and they grabbed 4 percent of the cloud computing market share last quarter. Thats far beyond Amazon and Microsoft, but near IBM with 8 percent and Google with 6 percent, according to Synergy Research Group. Alibaba stock is up about 170 percent over the last three-year, but some investor fear that Alibaba can be negatively impacted by the ongoing trade dispute between the worlds two largest economies, which is reportedly starting to hit China harder than anticipated. Alibaba stock is up about 170 percent over the last three years, which outpaced its industrys 96 percent.climb and the S&amp;P 500s 50 percent jump. But the trade war can hit Alibaba more than we like to think. On top of that, the Chinese economy is slowing. The stock is up only 2,3 percent last 12 months, while S&P 500 is up 17 percent and its industry gained 37 percent. Investors will await data on Alibabas cloud business, which is expected to nearly double YoY growth for its June quarter. Customer management revenue for Alibabas China Commerce Retail segment, which is driven by ads shown on Taobao and Tmall, rose 35 percent last quarter. The segment`s commisssion revenue, which is driven by Tmall, rose 39 percent. Jack Ma must have done something right with its intime department stores and innovative Hema supermarkets, as well as Ele.me, which is set to merge with Alibaba`s Koubei local services JV and its Tmall Direct Import online store. Alibabas China Commerce Retail segment rose more than 10-fold annually in June quarter. Cainiao is also contributing to Alibabas revenue growth. 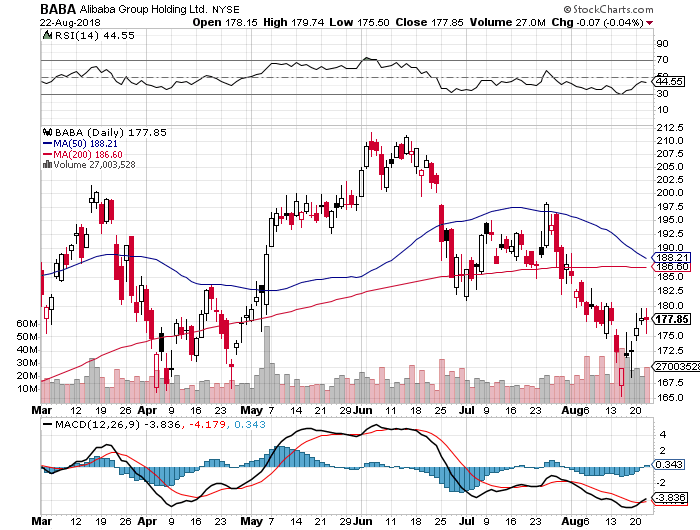 Alibaba Group Holding Limited is expected to report earnings on Thursday 23, 2018, before market open. The report will be for the fiscal Quarter ending June 2018, and the consensus EPS forecast for the quarter is $0,75 vs $0,94 for the same quarter last year.